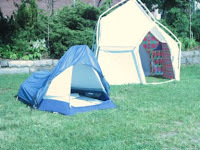 In 2006, Yurt City was born out of an idea for two friends to build a yurt and install it in a sculpture garden of a gallery in Brooklyn. The idea grew from building a single structure to creating a collaborative artist community. 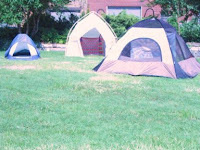 The sculpture garden at Dam Stuhltrager was a perfect test site to see how these yurt and tent interventions of Yurt City would survive being installed for two months during a hot, rainy summer. The positive reaction to Yurt City, our enthusiasm for the project, and interest in being part of something greater than our own art practice propelled us to seek other sites for this project to grow. 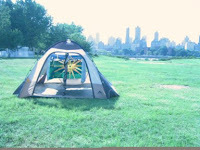 A year later, Yurt City II moved to the banks of the East River as part of FLOAT, a three week, biennial event at Socrates Sculpture Park. Another artist joined the group. Structures morphed and grew as a result of the change of location. 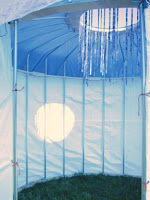 The following photos are from week one of FLOAT and Yurt City II. In true nomadic fashion, the structures were moved each week. Stay tuned for some visuals of a very grim day installing in the rain, photos of the site, Socrates Sculpture Park, other projects in the FLOAT event and our little community from other weeks.